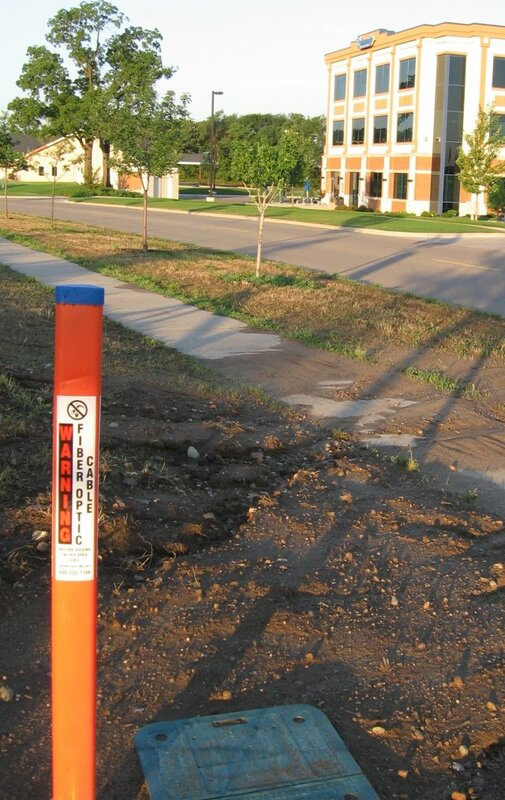 I’ve noticed crews installing fiber in various parts of southern Northfield the past couple of weeks. I look this photo last week near the Community Resources Bank on Jefferson Road. And then this article appeared in yesterday’s Northfield News: New fiber optic cable will be rolled out in Dundas. Jaguar Communications is the company installing the fiber in Dundas and their web site says “Jaguar is now offering Telephone and DSL service in Northfield, MN” but nothing about FTTP/FTTH. Seems like it would be easy/helpful to also have a fiber-related resource page on the Northfield Enterprise Center’s website, last updated in March of 2006. I’ll nudge Blake! Previous PostShould the City of Northfield be selling gateway drugs to its citizens? Alcohol, yes. Tobacco, no.Next PostNew sidewalks: love them or hate them? Jauguar told us (Dundas) that while they served Northfield already, it was done by renting existing infrastructure (slow DSL) from other providers. We were very happy when they explained that laying fiber through Dundas meant that they could offer it to the residents. Bridgewater township residents also may be able to tie in to the main fiber (which runs down county road 20). Bridgewater and Dundas residents should be pretty happy with this opportunity, and we hope local businesses will also benefit from this situation. So, maybe we’re ahead on the physical technology but behind on the philosophical mind-set? Hey, Griff, this really is on my get-to list. You raise excellent points. I have a massive folder stuffed with data and stats about how pathetic MN and the US are compared to the rest of the developed (and even much of the developing) world, and all the possibilities and applications that are unavailable to people and communities without sufficient bandwidth, and why it matters. The immediate problem is one of awareness and education. Why is what we currently have insufficient, and what are the implications if we stay where we are or, more likely, fall even further behind the curve? The implications of NOT utilizing new technologies (available only with speeds deliverable via fiberoptic cable) are staggering – particularly for businesses that want to become or remain competitive in the global economy. If the EDA and the NEC and the Chamber REALLY want to help business development in Northfield, they’d jump on this bandwagon and start playing really, really loud. Unfortunately that hasn’t happened yet. This is just a teaser for a big fat post furthering this topic from yours truly… Real Soon Now. Up to $25,000 from a foundation that supports rural Minnesota communities should help determine the future of fiber optics in the city. The money, from the Blandin Foundation, must be matched dollar-for-dollar by the city and used to conduct what Information Technology Director Melissa Reeder termed an open network feasibility study. Great to see this topic going! I think everyone is asking the right questions, including – why are the US and MN behind in terms ultra high speed broadband access? I think Tracy nails it when she says this is an issue of awareness and education. Many of the incumbent vendors claim there isn’t a market for fiber – but partially because people don’t know what to ask for or why to ask for it. With its wealth of colleges, I think Northfield is in a unique position to build up the education on broadband. Maybe that will spur some ideas for education. After all, who doesn’t love a friendly challenge? I look forward to reading more on broadband from Northfield! Greetings, Ann. Good to have you chiming in from Ireland. Hopefully, one of the orgs in town will set up a “fiber in our economic diet” blog where we can keep the townsfolk and our extended network updated as we go. We at the Blandin Foundation are delighted to support Northfield’s interest in exploring Open Access Networks as an option for your community. We think this new idea is worth taking a look at, and we’re pleased that folks in Northfield agree. Open Access Networks (OANs) are public-private partnership-based alternatives to the currently dominant model in the US of incument owned and operated, closed networks. They are unique, in that they are owned and controlled independently of any service or content that runs over them. Think of them like airports. Airlines pay airport authorities a fee for using the airports, or ground shipping, where trucking companies pay governmental entities license fees for using local roads. Imagine the inefficiency if every airline built its own airport, or if DHL, Federal Express and the US Postal Service all built their own roads over which to deliver their goods. Another benefit Open Access Networks offer is that they are intentionally structured to ensure that the benefit and value of broadband connectivity is passed on to end users to a far greater extent than closed public and private sector-operated systems. Good luck to Northfield in your important work of improving your community’s connectivity and positioning yourself to thrive economically in a challenging future.